4 June 2018 – On 29 May 2018, award-winning Emirati human rights defender Ahmed Mansoor has been sentenced to 10 years in prison for Twitter posts following an unfair trial. The Chair of the European Parliament Sub-Committee on Human Rights (DROI), MEP Pier Antonio Panzeri, calls for his unconditional release. “Such grave violations of freedom of expression are a stain on the UAE’s international reputation” he added. On 29 May 2018, the State Security Chamber of the Federal Supreme Court in Abu Dhabi sentenced Ahmed Mansoor to ten years imprisonment. Local media reports that he was convicted for “insulting the ‘status and prestige of the UAE and its symbols’ including its leaders” and of “seeking to damage the relationship of the UAE with its neighbours by publishing false reports and information on social media.” It appears that he had also faced the charge of “conspiring with a terrorist organisation” but was cleared of this charge. He was also fined one million Dirhams (€ 232.475 euros) and the court ordered him to be put under surveillance for three years on his release. Ahmed Mansoor is a pro-democracy and human rights campaigner who has publicly expressed criticism of serious human rights violations in the United Arab Emirates (UAE). Mansoor is the 2015 Laureate of the Martin Ennals Award for Human Rights Defenders, and a member of the Gulf Centre for Human Rights (GCHR) Advisory Board and Human Rights Watch’s Middle East Advisory Committee. Amnesty International considers him to be a prisoner of conscience, imprisoned solely for exercising his right to freedom of expression. The conviction and sentencing of Mansoor follows a grossly unfair trial. On 20 March 2017, Ahmed Mansoor was arrested by a dozen security officers at his home in Ajman and taken to an undisclosed location. His family was only allowed to visit him on three occasions, including on 3 April and 17 September 2017. He was brought to trial after more than a year in pre-trial detention without charge and was denied access to a lawyer of his choosing during the trial. In February 2018, two lawyers who had travelled from Ireland to the UAE on behalf of international human rights organisations to provide Mansoor with representation were denied access and were told by authorities that they had no knowledge of his whereabouts. There are concerns that Ahmed Mansoor has been tortured in pre-trial detention. In the weeks leading up to his arrest, Mansoor had used Twitter to call for the release of activist Osama Al-Najjar, who remains in prison, despite having completed a three-year prison sentence in 2017; as well as prominent academic and economist Dr. Nasser bin Ghaith, arrested in August 2015 and sentenced to 10 years in March 2017. Both men have been convicted of charges related to peaceful messages they posted on Twitter. Mansoor had also used his Twitter account to draw attention to human rights violations across the region, including in Egypt and Yemen. 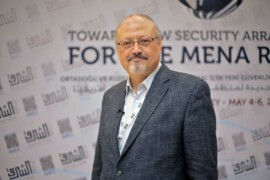 He had also signed a joint letter with other activists in the region calling on leaders at the Arab Summit who met in Jordan in March 2017 to release political prisoners in their countries. UAE authorities have persecuted Ahmed Mansoor for more than seven years. In November 2011, he was sentenced to three years imprisonment for “publicly insulting” the UAE president and other top officials in a trial marred by serious legal and procedural flaws. The UAE president pardoned Ahmed Mansoor on 28 November 2011, but authorities never returned his passport, de facto banning him from travelling abroad. He has also experienced physical assaults, death threats, government surveillance, and a spyware attack. This outrageous 10-year prison sentence against Mansoor, despite widespread calls for his release from UN human rights experts, European Parliament and human rights groups demonstrates once more UAE’s ruthless determination to silence peaceful dissent and its abusive criminal justice system used as a tool of repression against human rights defenders and activists. In recent years, UAE has pursued a huge crackdown on activists and government critics. Ahmed Mansoor was the last remaining Emirati human rights defender speaking out about human rights violations in the country. On 4 June 2018, the Chair of the Subcommittee on Human Rights (DROI), MEP Pier Antonio Panzeri, condemned the sentence and call for it to be quashed. He reiterated his previous call to release Ahmed Mansoor and added that Osama al-Najjar and Dr. Nasser bin Ghaith should also be freed. Detention of human rights activists are “grave violation of freedom of expression” and “a stain on the UAE’s international reputation”, he stressed. Ensure that he is treated in line with the UN Standard Minimum Rules for the Treatment of Prisoners, including by granting him immediate and regular access to a lawyer of his choosing, his family, and any medical care he may require. Allow UN experts, international NGOs or EU officials access to visit him. End the harassment of rights defenders and critics of the authorities. ECDHR urgently seeks the assistance of the EU Delegation and EU Member States present in Abu Dhabi to verify Ahmed Mansoor’s status and safeguarding his health by requesting permission from the authorities to visit him.